I'm sure it's well built, but the low ceilings, large setbacks and poor position on the site make it hard to turn into something worthwhile. I would rather see something that faces the street more. There was a proposal to build some really nice townhouses on the site back maybe 10-15 years ago. I wasn't thrilled about it at the time due to the lack of retail space but looking back they would have been sort of nice to see there, at least where facing Ionia and Seymour. Interesting.... Gillespie -- pushing the exact same building 10-15 years ago, just a different design style. I personally think this proposal feels more appropriate for Richmond VA or anywhere in the south. To me the Oliver Tower looks like Lansing (for better or worse). .....that said, I think the best cities have a mish-mash of architectural styles. So I would welcome this building on any vacant parcel or parking lot in Lansing. It's also a good urban building. Btw, Oliver Towers has density, height/scale, presence and a more sensitive-than-you-would-think entry plaza off the street at ground level (if I remember correctly)....this will be a spot where residents hang out and meet each other. The parking is tucked behind and pretty limited. The building is set back just enough to not obstruct views of the neighboring church. The building footprint takes up a healthy portion of the site, and what's left has been designed as green space that now has healthy looking mature trees surrounding the building. These will make the apartments beautiful inside if they are smart enough to leave the trees on site. Residents will be living in the tree canopy. Oliver Towers is a great urban building. I'm certain it will be a fantastic addition to downtown when the renovation is complete. That parking lot to the north is what's doing a huge disservice to this area. 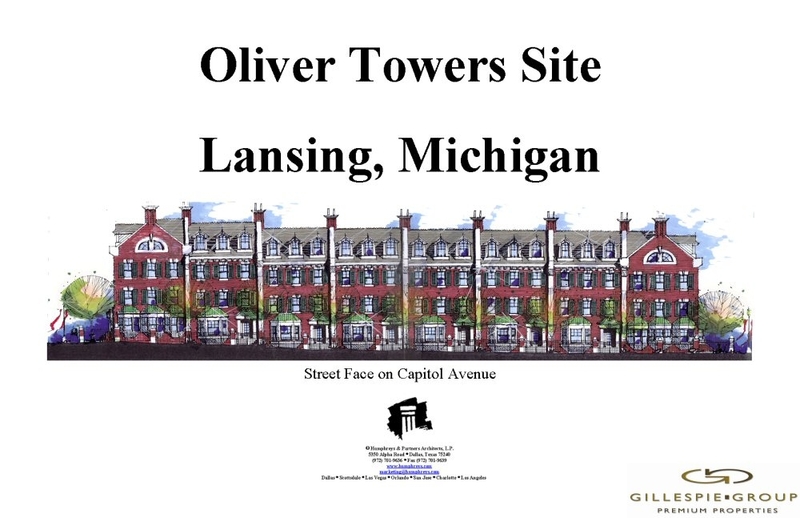 It would be awesome to see that Gillespie proposal built on the parking lot to the north of Oliver Towers. Yeah, I'd like to see it with the elevation (shown in the rendering) facing onto Shiawassee and with the addition of a 6-8 story tower at the corner of Shiawassee and Capital. I think this could feel like a big-city intersection with the right sized building. I've always liked the LCC building on that corner - it has a lot of presence. Yes, the trees there are really nice, the Oct. 2016 google pictures have some autumn color. Now that I look at more at this the building is situated well in its spot and the parking lot even has some nice trees. I think with the improvements I will like this building a lot more. They have not cut the trees down so far so maybe they are included in the landscaping plan. Mr. Gillespie must have had a different architect back then, this design seems very grand, unlike the buildings he has actually built. There is a nice photo of this building when it was new on the Lansing History facebook page. It was never a flashy design not bad just not very interesting.